Hi I'm Lenny from s.a and I've been around bikes since day dot. My old man worked in a fair few bike shops around adelaide so I've always had bikes in my blood. I grew up around 750fours and random kwakas. I ride an 01 softail that myself and old man rebuilt before he died, I also ride his cb750 that I've rebuilt. I've just started a rigid 750four project and also hope to find his old gold rigid. Dad when he first bought the softail and how it looks now. Interesting frame on the yellow Honda. Do you know where your dad bought it and roughly what year it would have been? 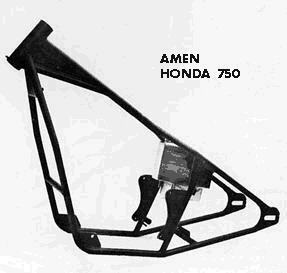 I think that Honda frame looks like an Amen rigid. Hey guys, from what I can tell it's an amen rigid frame. He would have had it somewhere in the early 80's, not sure who he bought it off but it was quite rough and painted black with a diamond tank. Scored an old king queen seat yesterday and with a tweaking it looks to a reasonable fit, it will be getting a full retrim in august. I also dropped the honda frame in for sandblasting so I can get on with things a bit, fingers crossed the hardtail will be welded on in the next few weeks tops. Who in Adelaide can get new fork tubes? I'm after a price on a pair of 4inch overs. You'll be quite safe with 4" slugs. I do them in stainless... just need one fork tube to copy. "You'll be quite safe with 4" slugs. I do them in stainless..."
I'm just wondering about your slugs - do you machine them to have a section that is a tight fit which extends down into the tube - beyond just the threaded portion? Yes; about 1¼". Have run slugs on my shovel for 170 thousand miles without them even coming loose. Have hit a couple of nasty things over that time one which slightly bent the steering head but did not effect the slugs. I will do up to 6" slugs as that allows the join to be an inch or so up from the bottom triple tree. Back in the day some US shops did slugs that joined below the bottom tree which is pretty scary and that is what gave them their bad name. Raked triple trees are another short cut that reduce trail often to a negative situation which is shockingly dangerous. In our Nanny state of Oz we can't go much over 8" legally on our forks before being outside a stupid 550 rule (axle to steering head centre measured horizontally), so raked trees of of no benefit.